For me there's nothing quite like a Sugar Cookie, and, if you add Chocolate it's even better! Of course, one can never have too many recipes for this perfect cookie. So today for National Sugar Cookie Day, here are three recipes for Chocolate Sugar Cookies. In shallow bowl, put granulated sugar on plate. Set aside. In bowl, stir together flour, cocoa, baking soda, and baking powder. In large bowl, melt 10 Tbsp butter in microwave. Do not overheat; microwave butter until just melted. Stir in remaining 4 Tbsp butter until melted. Allow butter to cool for 10-15 minutes. Whisk brown sugar, vanilla and salt into melted butter until smooth. Whisk in egg and egg yolk until smooth. Stir in flour mixture until just combined. Roll dough into balls -- 2 Tbsp for each cookie. Roll balls in white sugar and place on lightly greased or parchment-lined baking sheets. Flatten cookies to 1/4-inch thick. Sprinkle cookies with more white sugar. Bake 12-14 minutes. Don't overbake. Mix flour, baking soda, and salt; set aside. Melt chocolate and butter together in a stainless steel bowl over a saucepan of simmering water (or in a double boiler). Add 1 cup sugar, egg, and vanilla; mix well. Refrigerate 15 minutes or until dough is easy to handle. Shape dough into 1-inch balls; roll in remaining sugar. Place, 2 inches apart, on baking sheets. Bake 8 to 10 min. or until centers are set. Cool on baking sheets 1 minute. 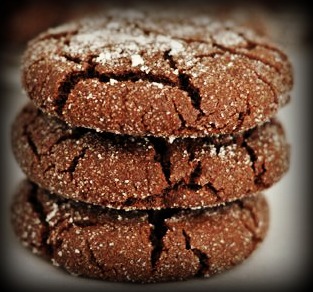 This third cookie recipe is for Chocolate Caramel Sugar Cookies! This easy recipe is adapted from Kraft. Feel free to use Kraft products such as the caramels and Planters Pecans-- or use your favorite caramels and nuts. Mix flour, baking soda, and salt; set aside. Microwave chocolate and butter in large microwaveable bowl on High for 2 minutes or until butter is melted. Stir until chocolate is completely melted. Add 1 cup sugar, egg, and vanilla; mix well. Stir in flour mixture until well blended. Shape dough into 1-inch balls; roll in 1/2 cup chopped Pecans. Place, 2 inches apart, on baking sheets. Make indentation in each ball. Microwave 1 package Kraft Caramels with 2 Tbsp milk in microwaveable bowl on High for 3 minutes or until caramels are melted..stirring after 2 minutes. Spoon into centers of cookies.